"It was my old enemy - the El." A Night in the Life of Jimmy Reardon stars River Phoenix as Reardon, a seventeen-year-old boy living on Chicago's North Side circa 1962. Strapped for college tuition, he struggles to find meaning in his life as his wealthier friends head off to school and his family life becomes more oppressive daily. Meanwhile, his romantic entanglements and philandering threaten his relationship with Lisa (Meredith Salenger), the only girl he really cares about. There are lots of things that don't work here—Jimmy's vaunted beat poetry is clichéd and awful, his relationships with others (women in particular) are shallow and self-serving, and his personal struggles are teacup tempests with little consequence to the story or Jimmy's own prospects. And the film's direction and cinematography are sometimes awkward, with many moments overplayed, underplayed or otherwise mishandled. But writer/director Richert makes some admirable, meaningful choices in the last act. I don't want to give anything away, but you may be able to make a few "predict-the-ending" wagering dollars from your jaded friends with this one. Sure, it's a movie about a selfish, angrily whiny young man, playing more as teen fantasy than any credible reality, 1962 Chicago or otherwise (though the Elevated Train as metaphor for the black hole of middle-class existence is an interesting idea). But there's some value here, even if it's extremely well-hidden; an agate in the rough, perhaps. Image Transfer Review: A Night in the Life of Jimmy Reardon is presented in its original 1.85:1 theatrical widescreen aspect ratio with an attractive anamorphic transfer. The source print suffers from dirt flecking, especially around reel changes, with a slightly soft late-80's look overall. There's just a bit of light grain in the image, and detail and color are generally solid if not spectacular. Image's DVD is free of distracting compression artifacts, and the film looks great aside from a few print flaws. Audio Transfer Review: Image presents A Night in the Life of Jimmy Reardon in its original Dolby 2.0 Surround audio as well as a remixed Dolby Digital 5.1 soundtrack. The presentation is generally solid, with clear analog dialogue and surprisingly crisp music, though there's nothing in the film that will really push anyone's audio system, and the rear surrounds are nearly unused. The 2.0 track sounds just a bit flat and muddy compared to the 5.1 discrete mix, but both sound just fine and support the film properly. Extras Review: There's nothing to see here— 14 picture-menu chapter stops, with no subtitles or other standard features, let alone any real extras. Move along, folks. 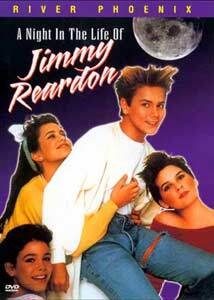 A Night in the Life of Jimmy Reardon is a late-80's teen movie with some degree of substance hidden beneath its excruciatingly angst-ridden trappings. Image's DVD features a fine transfer, but no supplements. Flawed, but worth considering as a rental.